The Commonwealth of Virginia has beautiful roadways throughout the state and great weather for a majority of the year, which leads to many dedicated motorcyclists. Every day, these bikers share the roads with cars, trucks, and other motor vehicles. For many, there are no negative consequences to these daily interactions, but when there is an accident involving a motorcycle, the harm suffered by the biker often is severe. Passing in an unsafe manner. 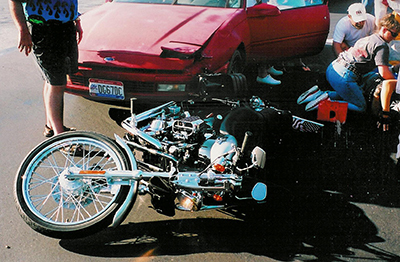 Unfortunately, the combination of factors means that when a motorcycle involved in a collision with another motor vehicle, the biker often sustains far more severe injuries that the occupants of the car or truck. Bikers also face far greater odds of being killed in a collision with another vehicle. Miscellaneous expenses – this catch-all may include the cost of accommodations in a home or vehicle to allow wheelchair access or the expense of a part-time caregiver who only became necessary after the accident. There are strict time restrictions that limit the time in which a personal injury case may be filed in Virginia, so it is important to contact an experienced motorcycle accident attorney as soon as possible. Accidents caused by the negligence of another person can devastate the lives of those directly involved in the accident, as well as their family and loved ones. Jason Swango knows how important it is to advocate for those who have suffered from terrible injuries, which are all-too-common in motorcycle accidents. At Swango Law P.C., we represent clients in personal injury cases in the Hampton Roads, Virginia area, including Virginia Beach, Norfolk, Chesapeake, Hampton, Portsmouth, Newport News, and Suffolk. Call us today at (757) 383-9229 to schedule an initial consultation.